Diamond Cuts: Terms and descriptions. There are many, many diamond cuts available for engagement rings. The oldest diamond cut types in design terms are the simplest cut shapes: Emerald cut; Cushion cut; Oval and Round cut diamond being some of the first shapes devised. The images below link to more info on some of the popular diamond types we see today. However, if you are interested in a specific cut that is not included here, simply send us a request. 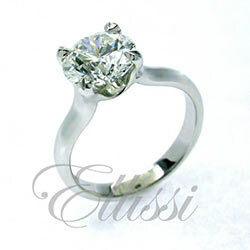 We will get back to you with more detail on the specific diamond cut you would like to consider. In order to describe a diamond, we of course give them names. These diamond names are usually one of two types depending on what it is the name is attempting to portray. The first is a cut name to describe the actual cut design, such as the Round Brilliant Cut. The second is a name given by a producer of a particular cut to in part capitalise on their investment. They attempt to gain a “brand” status. An example of this would be the Tiffany “Flanders” cut. These two ways of thinking about diamond cuts have given rise to multiple names for cut designs. These diamond cuts are often the same, or at least share a major similarity. An example of this doubling and in some cases tripling of names would be: Emerald cut; Square Emerald cut and Asscher cut. Basically each is to some extent interchangeable. Compounding this is that naming rights for specific cuts can be controlled by registered owners. Diamond grading labs have become quite adept at describing diamonds in different ways so as to not violate trademark laws. For example, the GIA call the Princess Cut diamond a “Square Modified Brilliant” cut. They call a Radiant cut diamond a “Cut Cornered Square Modified Brilliant”. Quite a mouthful. You can see how confusing this can become! Many of the newer cut types are hybrid cuts combining the attributes of two or three traditional cut types. Diamond cutters often try to come up with something new so that they can get an edge in the market. This can be lucrative. Especially if they are able to brand a diamond and control the release of it by patenting the cut design. This gives some retail outlets the control of these cut types in the engagement rings they market. If it is a really great cut then eventually other cutters may copy it. If the design adds little to the existing diamond types available, then it may well fade into obscurity. Over the years diamond cuts have been improved, changed and modified. This is because of the advent of better technology and an improved understanding of light refraction. Mathematical proportions have been applied to cutting in particular, the Round Brilliant cut shape. The aim is to cut the diamond so that the white light entering the diamond splits into the colours of the spectrum in the most efficient way. Of course this is what we see in the diamond as its sparkle, or scintillation. To get a great diamond for an engagement ring, you really need a diamond that is “well cut”. It is an essential requirement if you want the best result. The GIA ( Gemological Institute of America) is a leading lab in the field of diamond grading. 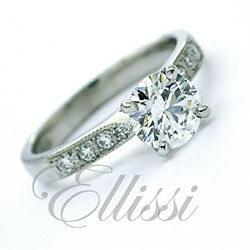 It has spent much of its time working out the best cut parameters for the Round Brilliant Cut diamond. Diamonds that meet the tight tolerances of the GIA’s highest standard for very best cut round diamonds are given an “Excellent Cut” grade. The GIA were not the first to come to the conclusion that there must be a “Best” cut when it comes to diamonds and light return. Others have also designed optimum cut parameters. Most notable of these is the father of the round brilliant cut, Marcel Tolkowski. Around 100 years ago he came up with a mathematical formula of the best cut proportions to deliver the optimal return of light for a round diamond. Today most people are of the opinion that the GIA “Excellent Cut” is the highest grade. It applies only to round diamonds with a specific arrangement and facet number. It must be said that some disagree with the exact specification of best cut. Best Cut? Best Yield? Decisions. Decisions. When it comes to cut, diamond cutters have a choice: cut the best possible parameters and get a great cut, or cut the diamond to maximise its finished weight. This is called the “yield”. Every diamond is individual and unique. A cutter needs to consider how they can derive the best return from the rough diamond they are cutting. It could be that the diamond “rough” is cut into one large diamond or that in fact it will be better to cut more than one diamond from it. This can result in multiple diamonds from one original crystal. It is a complex decision based on multiple factors such as stock levels, diamond demand, yield versus return and the possibility of better grade combinations. Should the diamond be cut to retain weight? Or should the cutter remove the less clean material, resulting in a smaller but better diamond? What shape should the cutter cut? Some cuts such as the round brilliant cut and cushion brilliant cut diamonds have more wastage than other shapes. How much an engagement ring costs relates directly to the decisions the cutter makes about the diamond well before the engagement ring is even thought about. “Fancy shape” is a term used for all diamonds except the Round Brilliant cut diamond. This includes cuts such as the Cushion cut, Emerald cut, Asscher cut, Pear shape, Radiant cut, Princess cut, Baguette etc… the list goes on and on. These fancy cut diamonds were developed in order to maximise the return from the various shapes in the diamond “rough,” giving a higher yield (a heavier diamond once cutting is complete). Also, of course the development of different cut shapes allows for greater design choice in engagement rings. It is also possible to design a new diamond shape and patent this, if it is judged by the patent office to be unique. Obviously this gives the owner the opportunity to control its release and sale. This is not frequently done however, as the costs tend to be prohibitive to produce, promote and defend ownership. Fancy Diamond Cuts are Less Costly. An engagement ring with a cushion cut, princess cut or pear shape diamond for example, will be less costly than the equivalent weight in a Round Brilliant cut, assuming the grades are equal of course. That can make the fancy cuts better value. The resulting higher return the cutter has in carat weight, makes the fancy cut diamond a lower cost in the market. This in turn produces an engagement ring with a fancy shape diamond that will generally be less cost than the same sort of design in the round brilliant cut, weight for weight and grade for grade. The only snag with this, is that the mix of cut parameters is infinite. What is one person thinks is a perfect cut, is not so for everyone. It is a very subjective issue. First tier grading laboratories like the GIA have decided not to nominate a set or exact cut parameter for the fancy cut diamond types. Basically it is simply a fact that fancy cut diamonds are way too varied for a definitive decision on “best cut”. Therefore no cut grade is given in the certification, just a description and some reference to quality elements. Variability of Cut in Diamonds. As there are so many variables in diamond shape and cut quality, sound advice should be sought when looking at diamonds. With no technical guidance in the cut grade for 90% of the options available, you can get very, very poor looking diamonds in all cut types. A great cut in a particular diamond shape is critical to how your engagement ring will look. You may get the right weight and colour etc BUT a really great looking diamond? That takes knowledge and an understanding of all the potential issues. The resulting engagement ring will reflect good guidance and reward the wearer for a lifetime. If you have spent even just a few minutes working on diamond prices, you will have already discovered that there is no one set cost for diamonds. Variations in grades, lustre, carat weight, and of course the cut, amongst other things, lead to massive swings in prices. It can be why the price of a ring may appear to be relatively low, when compared to other diamond rings that are set with diamonds of apparently equal grades. There are reasons why costs vary enormously. You are not getting a bargain if you don’t understand why the cost is lower. For more info on the issues in diamond selection, click on this link: beware dodgy diamonds. As with all diamond selection, expert advice from a professional is crucial if you want a great looking diamond and ring.